A postcard depicting St. Paulinus' Church, a Baroque church in Trier, Germany. It was constructed in 1753 and is the third structure to be built on that site. Original 5 x 3 inch color photographic postcard: ACC# SM-00-243, file folder 1A (non-U.S. blanks), box 10A, Lucile (Mary Lucile) Campbell Collection, UCF Public History Center, Sanford, Florida. Digital reproduction of original 5 x 3 inch color photographic postcard. Originally published by Mosella-Verlag GMBH. Thomas, Charles. Christianity in Roman Britain to AD 500. Berkeley: University of California Press, 1981. 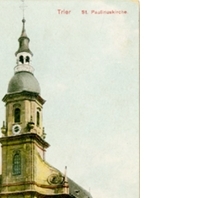 “Trier St. Paulinuskirche Postcard.” RICHES of Central Florida accessed April 23, 2019, https://richesmi.cah.ucf.edu/omeka/items/show/6648.